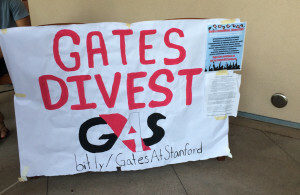 Following the announcement of Bill and Melinda Gates as Commencement speakers for the upcoming Class of 2014 graduation this year, students began forming a movement requesting the Gates Foundation to divest from company G4S. As of yesterday, 1100 people had signed a petition calling for divestment due to a “litany of human rights abuse and concerns” that the statement claimed G4S was complicit in. On Wednesday, a stock exchange filing showed that Gates had sold down his stake in G4S to below three percent. It is unclear exactly how much stock Gates still holds because three percent is the lowest threshold at which investors must declare. The student group organizing the protest released a statement applauding Gates’ decision to sell down his shares. According to Clayton Evans ’15, another student organizer, there are about 40 active members in the coalition, which officially began its push for student mobilization of the campus about a month ago. The student coalition also includes representatives from a wide array of student groups including Fossil Free Stanford, the Student Labor Alliance, the Stanford Asian American Activism Committee, Stanford STAND and Students for Justice in Palestine. “It’s not about being against the Gates, it’s about trying to make the Gates Foundation hold true to its principle because it does so much good and is an amazing entity,” Evans said. In its press release following the divestment, the Stanford campaign said that it would continue to call for broader action than selling shares from G4S. The group said that it is still asking for the Gates Foundation and its Asset Trust to complete divest from G4S, reevaluate its investments in companies under investigation for human rights abuses and to publicize its policy of socially responsible investment.